A pair of pre glued 1/10 GT wide rear tyres on black carbon wheels. 35 shore Italian foam. 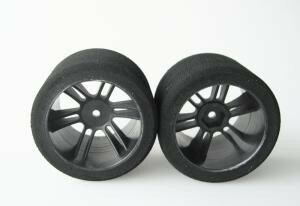 GREAT WIDE TIRES FOR DRAG RACING OR SPEED RUNS!!!!!!!! !